Federal Polytechnic, Offa admission acceptance fee payment procedure for the 2018/2019 academic session newly admitted ND (Full-Time and Part-Time) and HND (Full-time) Students. OffaPoly acceptance fee is N15,000. This is to inform all the candidates offered provisional admission into the Federal Polytechnic, Offa (OFFAPOLY) various National Diploma (ND) and Higher National Diploma (HND) programmes for the 2018/2019 academic session, that the management of the institution has announced the amount to be paid as acceptance fee, payment procedure and the payment deadline. Offa Poly Acceptance Fee Payment Procedure. 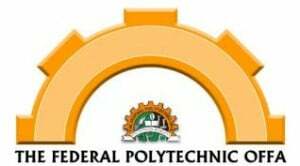 Federal Polytechnic Offa IJMB Admission List. Federal Polytechnic Offa ND Full Time Admission List. Federal Polytechnic Offa ND Part Time Admission List. Federal Polytechnic Offa HND Full Time Admission List. Federal Polytechnic Offa Degree Admission List. Offa Poly Acceptance Fee: N20,000 (Twenty thousand naira only) for Degree. N15,000 (fifteen thousand naira only) for ND (both full-time and part-time) and HND (full-time). N10,000 (ten thousand naira only) for IJMB. Degree: 31st January, 2019 (for 1st, & 2nd Batches). HND Full-Time: 15th March, 2019 (for 1st, & 2nd Batches). ND Part-Time: 15th March, 2019(for 1st, 2nd & 3rd Batches). ND Full-time: 15th March, 2019 (for 1st, 2nd & 3rd Batches).